Yesterday, 49 people were shot and killed in Christchurch. The attack has shocked the nation. I am sure you have read or heard about it where you live: for once New Zealand is in the news, and not for anything good. These events always make you stop and think for a moment, and one of the best places to do this is outside in the garden. I am sure all the other Six on Saturday bloggers will agree. Thanks once again to The Propagator for allowing us to share what is going on in our gardens. First up, a moment of reflection, looking at one of the ferns. 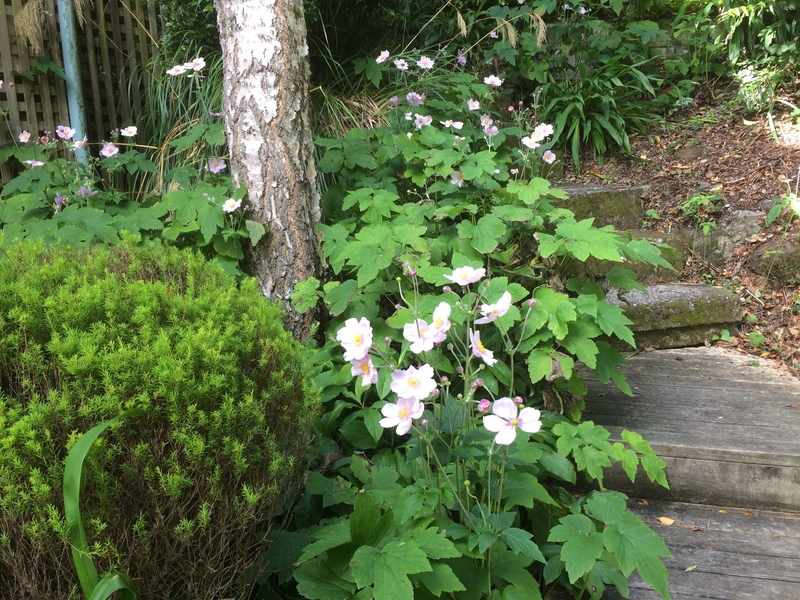 The Japanese Anemones continue to bloom and add a gorgeous splash of pink in amongst the green. There are several clumps of them dotted about by the side of the house. The marigolds are still going strong, with new blooms adding a touch of colour to the pots on the terrace. A nasturtium has popped up in an unexpected pot…but will just leave it there. I will need to do some trimming and replanting here, but in the meantime, the oregano and spider plant are making friends. The rosemary that I moved to a better position is beginning to rejuvenate, including having flowers. I missed last week as we were away for the weekend over in the Wairarapa. Two weeks ago I posted a picture of a camellia bud and here is another. I am so looking forward to seeing the blooms again. Sorry for the brevity of today’s post, and lack of updating on the seed trough. I was out again today and my gardening will be done tomorrow! Yesterday was a terrible day as we sat and watched events unfold on TV. Although I haven’t lived in NZ for many years, I am devastated with what has happened in my beautiful homeland, and my heart breaks for those poor people who escaped terror in their homeland only to find it again in the peaceful place in which they had chosen to settle. You’re correct about finding a little solace in a garden. So sorry to see what has happened in Christchurch. What has the world become? It is a sad day for the country. I think the country is still I shock. Not the sort of thing we expect here. Lovely anenome. Got a set of three in order. Shocked by the events in NZ. Sad that people can’t find what unites us all rather than divide. Agree with previous statement of solace in gardening. So sad to hear the terrible news out of New Zealand. A garden is a good place to reflect on these sorts of things and what can be done to counter the narrative of hate. I wouldn’t want my garden to be where I buried my head in the sand. A garden is a good place of reflection, and I agree it is not a place to bury your head and ignore the world, but it can be a good place to switch off. Luckily the video footage has been removed. I’m baking and gardening this weekend! So very sad. Glad you can seek some solace in your lovely garden. That marigold is rather jolly. Unlike the news, awful awful. So awful to hear about events yesterday. Completely agree that the garden brings solace at our worst times. Beautiful anemones. I wish our rosemary would flower once in a while! Terrible news but your right, the garden provides a bit of solice and a place for quiet reflection. My thoughts and love are with Christchurch this week. That tree fern is beautiful and you’re right – a great view for reflection. Gardening is such wonderful solace. Thanks. Being in the garden is peaceful. Gardening is indeed a wonderful solace, and your garden is lovely. So very, very sorry about what happened. Halfway around the world, our hearts are aching for you and for all the families who are grieving. Unfortunately, in the United States, we are all too familiar with such an event. A lovely thoughtful post. Japanese anemones are so very charming and easy going and I love it that you are also showing a spider plant this week. Like you said, a garden is a good sanctuary. Yes. The country is still in shock. I like how the marigolds are still flowering, mine have finished. Yes the news in Chch – I watched it on my day off, still can’t believe it. Yes I am amazed that there are still a few marigolds. I was at work on Friday and we all just stopped and followed the news. I am late this week… when we read about tragic events such as Christchurch and the suffering of those poor families, it helps put our own lives into perspective. Another fine six selection. thank God for our gardens and a place to find sanctuary from the insanity that invades our daily space. Thank you. There has just been a 2 minute silence…so now we can move on.